When teachers are looking for a text that will engage children in the act of beginning reading, what could be better or bigger than one on dinosaurs? 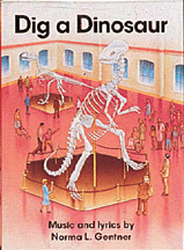 Dig a Dinosaur delivers an original song that will make students want to stand up, sing, snap, and "become" paleontologists. The lyrics examine paleontology, oviparous beings or egg layers, meat versus plant eaters, and a possible extinction theory.